If growing old has any advantages – other than the obvious one, that the only other option is worse – it is that you can remember when folks did things differently, and bore younger colleagues with it. As an old political writer (not revealing an age, but old enough to qualify for Medicare while not enough to get full Social Security), one favorite memory is the way we used to do candidate filing week, which starts Monday. Back in the days before the internet made it possible to file and pay one’s fee online, candidates would camp out on the courthouse lawn the night before filing opened. This wasn’t to prove their stamina or the ability to start a fire by rubbing two yard sign sticks together. It was to get the best spot on the ballot. By being the first person to file in a particular race, one would be listed first on the primary ballot for that office. In a race with a large number of relatively unknown candidates, having one’s name first was thought to be good for 4 or 5 percentage points because undecided voters would go with their first choice. Even in a tight race between two well-known contenders, it was thought to be good for a point or two. Notice the phrase “thought to be.” Try as I might as a novice political reporter, I could never find any hard data to prove it. But in those days candidates didn’t pay attention to data. They went by what old politicians said was by God the way it was done. To pass the time until the courthouse opened, candidates sometimes played board games, like Monopoly, or poker. Or they’d talk, drink, snack, drink, gossip, drink … and maybe catch a few winks. Reporters didn’t usually spend the night out on the lawn but would show up around dawn for interviews, particularly helpful for filling out that day’s story for the afternoon paper, which had a first deadline of 10:30 a.m. Sometimes you’d get a first look at a previously unannounced candidate for some office, and get a chance to decide whether he (or she) was a comer – a term that probably hasn’t been used since then. State law eventually got rid of the “early bird catches the worm” rule, requiring ballot positions to be awarded by drawing lots. For a few years, candidates still showed up a bit early, hoping to get a bigger mention in that first filing day story or the noon news. Now they often make it to the elections office sometime during Day 1, more as a way of showing resolve to run, and discouraging any potential challenger that’s ambivalent about getting in. The other big period of filing week was, and to an extent still is, Friday afternoon, in the hour before the elections office doors – and filing – close. Potential candidates drop by to scan the lists and see whether that office they covet has what they consider weak or at least reasonable competition. Some who have filed wait around to see if they pick up any new challengers. In years when judicial candidates are on the ballot, the incumbents might find a reason to come by the elections office, which admittedly was a more casual drop-in for Spokane judges when the office was in the courthouse instead of a block away. The reason is pretty simple when you think about it. Incumbent judges typically run unopposed in Spokane County, which means campaign expenses are relatively light. But in years when there are no openings on the bench, at least one judge usually draws a challenge from Spokane’s stable of legal lions. For all incumbents hoping to run unopposed, judicial or otherwise, nothing is settled until the elections office door is closed and locked. Note for procrastinators out there: County elections offices close at different times because budget cuts mean some are on reduced hours, and Fridays are often the day when hours are reduced. If you’re planning to get in just under the wire, best to check when that is. Sen. Mike Baumgartner and some other legislative Republicans are still steamed about Supreme Court Justice Mary Yu’s speech to the Washington Education Association gathering in Spokane last month. But they’ve revised their tactic. As Spin Control reported on April 29, Baumgartner, of Spokane, contended the speech should disqualify Yu from a case involving the WEA. At the time, he wanted her to bow out of upcoming arguments in a case involving charter schools. She said it wasn’t necessary because her speech was about the importance a teacher had in her life, not about anything connected to the case. Last week, Baumgartner and a handful of other lawmakers filed a formal motion with the court for Yu to recuse herself … but not from the charter school case. Instead, they want her pulled from the McCleary case, which possibly is winding down if they and their fellow legislators finally managed to do right by the 2012 court order. 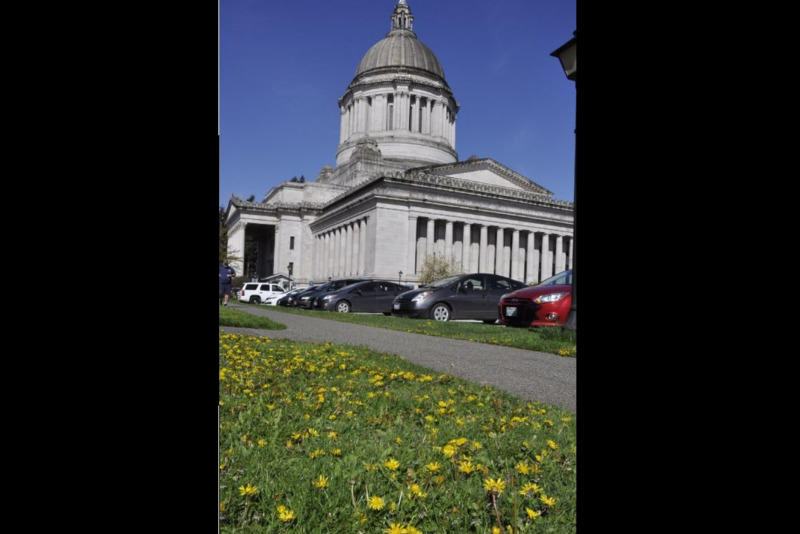 The switch seems odd unless one remembers that legislators are a party to the McCleary case. They aren’t a party to the charter school case, and thus don’t have standing to ask for a judge’s recusal. The court will decide when, and if, to hear arguments on the motion along with other things pending on McCleary.